Oh, the wonder of Christmas! Stores decorated in red and gold by November, Christmas music streaming. We were programmed like Pavlov’s dog to start thinking about what presents we should buy or what we wanted for ourselves. Our Saturday cartoon marathon included commercials of kids playing with the latest toys from Mattel. Pages of the Montgomery Ward “wish book” were ear marked in eager anticipation. I don’t know when it happened, but somewhere along the way how many presents I got (and how personal they were) became equated with how much I was loved. 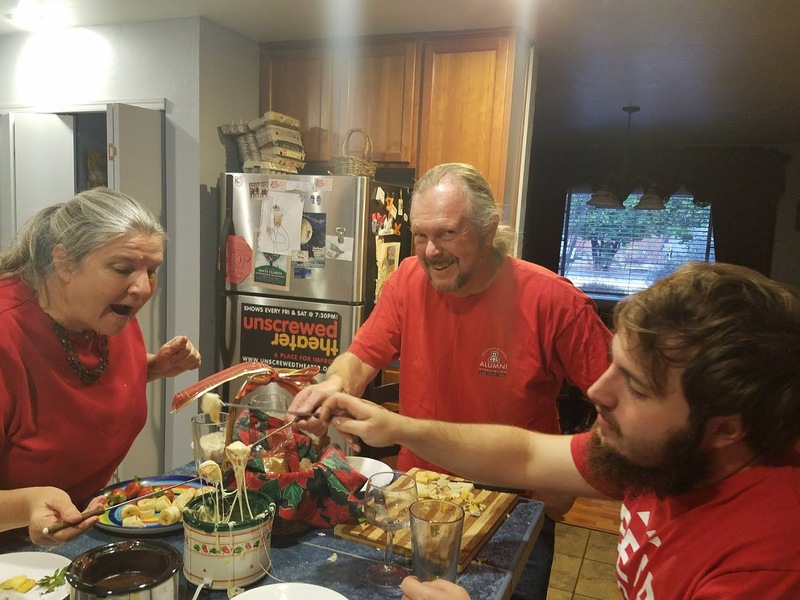 Perhaps it started with the shiny trikes under our Nana’s tinsel tree and Uncle Jim climbing up on the roof and ringing Santa’s sleigh bells. That’s how our new Nana welcomed us into the family fold. 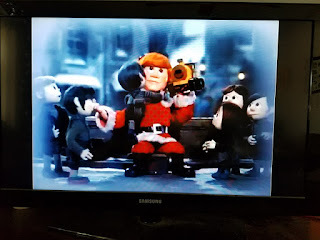 And then there were those beloved Rankin Bass Holiday Specials that taught us that gifts were love. 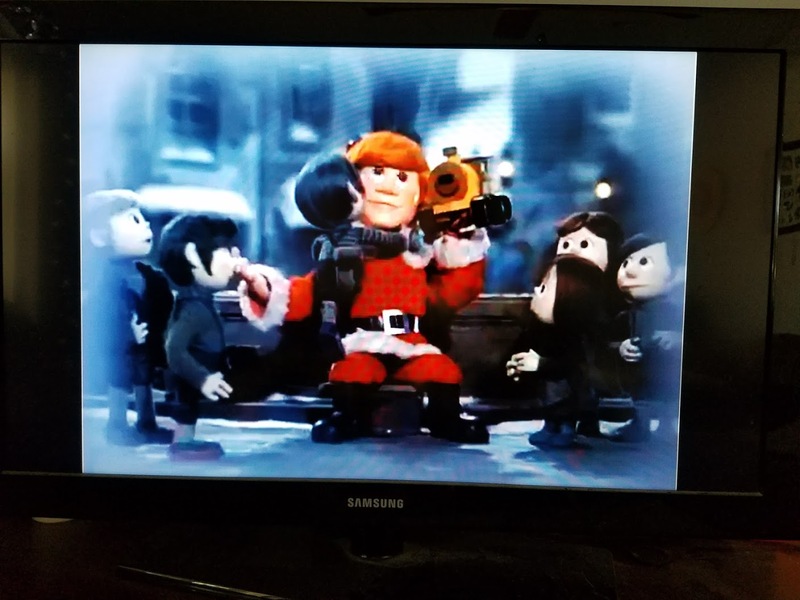 In “Santa Claus Is Coming to Town” Kris Kringle sang “Give a little love” to the children as he distributed his gifts. In “Rudolf the Red Nosed Reindeer” there was a real sense of urgency about getting the gifts to the children by Christmas morning so they wouldn’t feel disappointed or unloved. Even the toys wanted to be loved! It didn’t matter how poor you were. The message was clear - It wouldn’t be Christmas without presents. Remember the Hallmark TV movie, “The Gift” in which the couple both sold their most cherished possessions to buy a prized gift for their loved one? Even little Laura Ingalls on “Little House on the Prairie” agonized over getting Christmas gifts for her family. 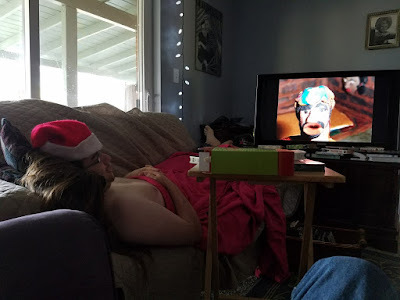 As a teen, I loved playing Santa. I would use my November birthday money to buy presents for my little sisters – like the tiny porcelain animals Kami got every Christmas. My favorite part was sneaking up in the night and putting the Coca-Cola flavored lip glosses and other fun trinkets into my siblings’ stockings. This always made me feel good. It was my way of expressing love to my family. As many of you know, Dan and I got married a year ago - so this is our third Christmas together. We are learning, through fits and starts, how to combine our old traditions with more sustainable ones. Since I’ve been with Dan, I’ve become more aware of how much we waste during the holidays from too much food - to unwanted gifts - to wrapping paper. We usually have a whole trash bag full of wrapping paper to go out with the garbage on Christmas morning. What if we took a cue from Nana and reused the wrapping paper, gift boxes and bags we already have? We could tie reusable ribbons around gifts wrapped with colorful cloth from my scrap pile! What if we stopped buying the latest Christmas lights and decorations and set up that old Christmas village that was packed in the shed? With a little creativity we could make Christmas decorations out of recycled materials! And what about all those presents? Even my boys said we should stop buying things they don’t want. What if it didn’t take a gift to make me feel loved? I have to admit that I felt a little depressed because I only got two gifts on my birthday. (One from Dan and one from my mother...) When it really came down to it, I was lonely because I needed to catch up with my girlfriends. 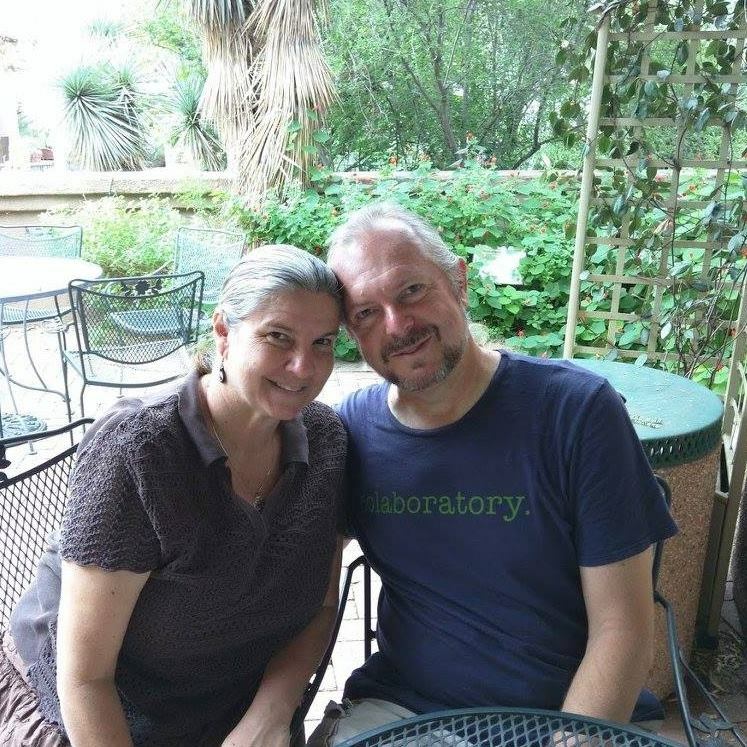 I felt better after I got on Facebook and set a date to meet a friend for a long overdue lunch. 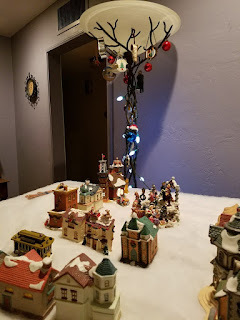 When I first started writing this blog, my mom called to see what the boys wanted for Christmas. I shared what was on my mind. 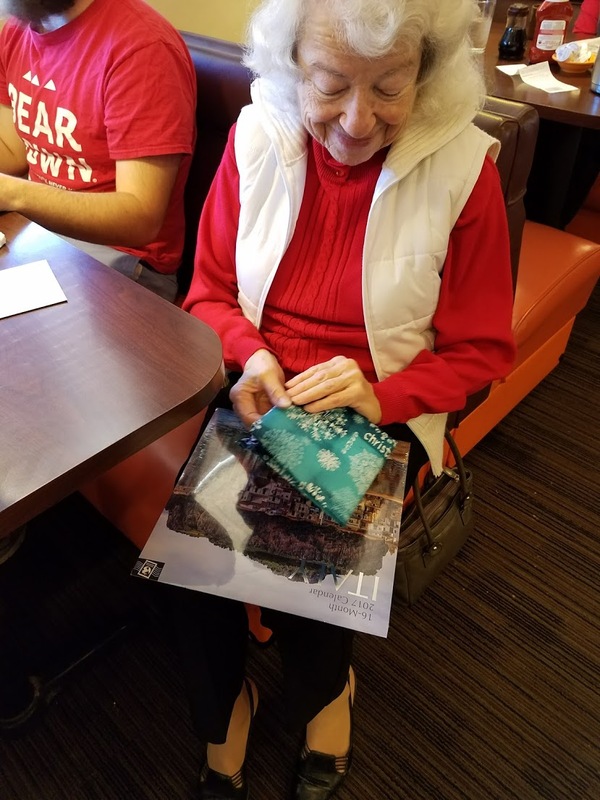 Before she hung up, she blurted out, “Well, I like to get a little something.” My mom, who is on a limited retirement income feels compelled to get “a little something” for each of her 11 grandkids. To her credit, she often tries to find something creative (like the oil pastels that inspired me as a child). I hate to say it but most of those art sets have been stashed away under other unused toys. (Sorry, Mom!) I know this is done out of love and a need to feel closer to out of town family. I know because I used to get joy from sending Christmas and birthday packages. They often included the latest pics of the boys so relatives would feel included in their lives. I would make some into magnets so they could see their smiling faces every day. So…if I send presents to feel more connected to distant loved ones, why not just call or text them? I have always loved Christmas. But looking back it’s not the presents I remember. 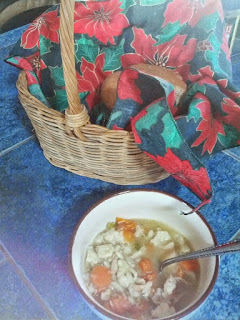 My fondest memories of Christmas are the sentimental moments of family tradition. Getting together on Christmas Eve, seeing my cousins, the smell of Nana’s homemade chicken and dumpling soup, Christmas music playing. Ah… the music. My happiest memory is bundling up under a cover in the back of an old pickup truck and belting out Christmas carols with my friends from our church youth group. When I grew up, I tried to recreate that feeling with an annual Christmas sing-a-long party. But that’s gotten hard to pull off with everyone’s busy schedules, so Dan and I attend The Loft’s "fabulous" Christmas sing-a-long party instead. What if our Christmas festivities didn’t revolve around opening presents? What if we found other ways to make people feel loved other than buying them more stuff? What if we gifted our time and attention instead of giving presents? We didn’t manage to totally get away from exchanging gifts this Christmas. But Josh and I made a day out of shopping for materials for Josh’s gift – a Roman tunic. 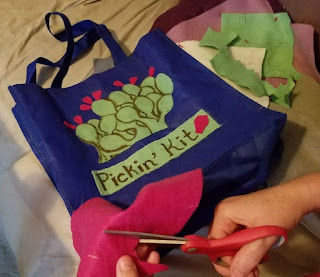 I created a prickly pear pickin’ kit out of a reusable bag. 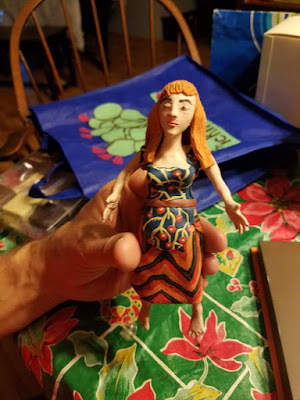 (I covered up the TEP logo with felt…) Josh made a clay figure for Dan. Most of our gifts were actually from the Thrift Store. I never could master getting the tape off of the wrapping paper. (sigh...) But we did reuse some gift bags and we decorated our makeshift (lamp) Christmas Tree. You are all welcome to join us in our new holiday tradition of belting out Christmas songs at the top of our lungs or just spending time together! Have a blessed Christmas! God sent his remarkable gift in a humble manger. I do try to reuse wrapping paper of gift bags. (Especially gift bags.) The lady I had as a prayer partner at church requested used books and I found lots of those in great condition. (I write in all of mine.) Still I don't want to throw the baby out with the bathwater, and still enjoy giving little gifts, even sometimes new ones. Thanks for all the lovely memories, daughter. I love you.